Four diplomats from some of America's biggest trading partners discuss the possibility of a global trade war and other issues during a panel discussion Tuesday, June 5, 2018, in Lawrence. 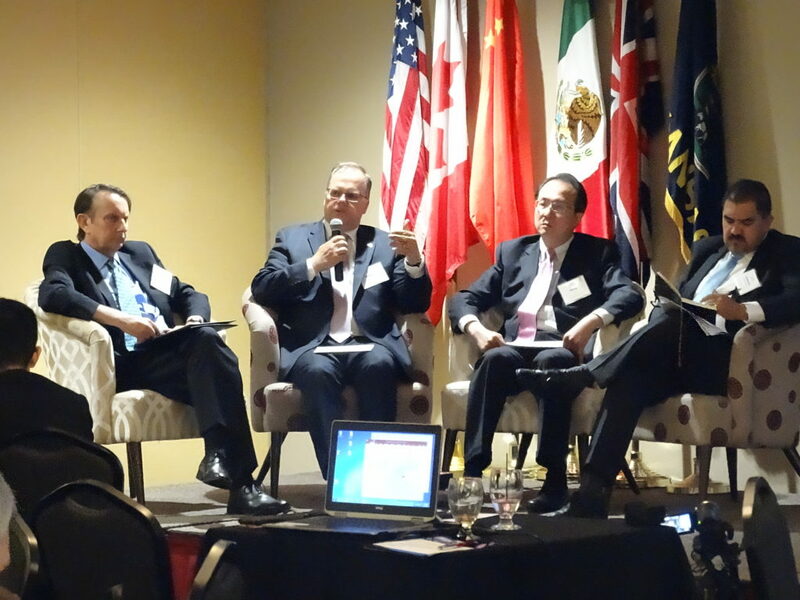 They include, from left, John Saville, Consul General for the United Kingdom; Stephane Lessard, Canadian Consul General; Chinese Consul General Hong Lei; and Guillermo Malpica Soto, head of Mexico's Trade and NAFTA Office, Ministry of Economy. A senior diplomat from Canada said Tuesday that Kansas businesses will soon start paying a heavy price in exchange for the tariffs that President Donald Trump imposed last week on imported steel and aluminum from other countries. Using exceptionally strong language for a diplomat, Stephane Lessard, Canada’s consul general based in Denver, said Tuesday that his country was stunned when Trump announced the tariffs May 31. “I have to say we find the decision of the administration simply unacceptable. We find it absurd, frankly, and also insulting,” Lessard said in an interview with the Journal-World. His words echoed similar remarks that Canadian Prime Minister Justin Trudeau made over the weekend. Lessard and three other diplomats from some of Kansas’ biggest export markets — Mexico, China and Great Britain — spoke in Lawrence Tuesday as part of International Trade Day, an event sponsored by the Kansas Department of Commerce to help Kansas businesses branch out into international markets. Their appearance, however, came just five days after the Trump administration announced it would impose tariffs on imported steel and aluminum from Canada, the European Union and Mexico, nations that had been exempt from similar tariffs the administration imposed on other countries earlier this year. Also last week, Trudeau abruptly canceled a meeting in Washington where Canadian, U.S. and Mexican officials hoped to reach a deal to rework the 24-year-old North American Free Trade Agreement, or NAFTA. Trudeau canceled the meeting in reaction to Vice President Mike Pence saying the U.S. would insist that any new trade pact have an automatic five-year sunset provision. Lessard said the cancellation meant that it is now highly unlikely that any final agreement can be reached in time to have it approved by the current Mexican government because of that country’s upcoming July 1 presidential election, or by the current U.S. Congress because of its upcoming midterm elections in November. In response to the steel and aluminum tariffs, Lessard said, starting July 1, Canada will begin imposing tariffs on an equal value of U.S. exports to that country, tariffs that will affect about $100 million worth of Kansas exports to that country. That will involve such items as aluminum plates and sheet metal, household and toilet articles made in Kansas, and motorboats and outboard motors, three categories of goods that accounted for just over $40 million worth of Kansas exports to Canada in 2017, according to numbers provided by the consulate. It will also affect Kansas exports of certain kinds of beef and other meat products, as well as some other kinds of processed food made in Kansas. Lessard spoke to the Journal-World just before taking part in a panel discussion with diplomats from Great Britain, Mexico and China. The discussion focused largely on what strategies Kansas businesses should use if they want to enter those markets. But the conversation quickly turned to the recent tariffs, and trade policy under the Trump administration generally. Hong Lei, China’s consul general, based in Chicago, said relations between his country and the U.S. have been strained since the United States launched an investigation in August into allegations of unfair trading practices on China’s part, and the Trump administration has threatened to impose tariffs on Chinese imports if China doesn’t start buying more American exports. Meanwhile, Guillermo Malpica Soto, head of Mexico’s Trade & NAFTA Office, within the Ministry of Economy, said U.S.-Mexican relations have evolved far beyond imports and exports. That, he said, could lead to new opportunities for American businesses to expand into Britain, and for Britain to invest elsewhere. “It’s kind of obvious that if you are disentangling yourself from a very complex and quite bureaucratic set of rules, regulations and entanglements with a club of 27 countries, once you get over that, once you get through that, that will inevitably give you more time, more interest, and potentially more resources to engage elsewhere in the world,” he said.